Most people have probably driven by Wyland's work without even knowing it. His giant murals of life under the sea adorn the sides of buildings throughout the United States. He set a goal 25 years ago to do 100 of them and he recently completed his 95th. The Early Show national correspondent Tracy Smith went with Wyland on the dive he based his latest work on. Wyland, who goes by only one name, paints works called "whaling walls" — wall-sized murals of whales and other sea creatures. He has also hosted his own show on "Animal Planet" and his art is seen by more than 1 billion people a year in museums, galleries, public murals, and public and private collections throughout the world. To understand what inspires him Smith went deep and joined him on a scuba dive off in the Florida Keys, where he first started diving 25 years ago. "When I'm diving I'm painting," he said. "And I take my camera and I look at the light and how the light paints the reef. And it reminds me of what I'm gonna paint later on the wall." The Florida Keys National Marine Sanctuary includes the only contiguous coral reef in North America. As he swam, Wyland took pictures of brain coral, elkhorn coral, clouds of yellow fish and a wounded shark drawing its last breath. "I think we're gonna have to paint a nurse shark in there," he said. When Wyland started painting whales he was like most artists, struggling to make a living, but he became popular very quickly. "I was painting generic whales on canvas and marine life," Wyland said. "And I decided, hey, I need bigger canvases." So he switched to walls. The first was in Laguna Beach, Calif. After that painting was done, he vowed to do 99 more. "I believe that if I paint 100 walls and a billion people annually go by these walls, we're gonna inspire people to care more deeply about preserving the animals, the oceans and the water systems," he said. He holds the record for the world's largest painting but it is the smaller ones that bring in the money. Today, an original Wyland can fetch nearly a $500,000. More accessible works are sold in Wyland galleries across the country — a commercial success that's made him a target of critics. "Eventually, my paintings began to sell — and I mean wildly popular — and I became successful," Wyland said. "You know, I never wanted to paint for art critics, I wanted to paint for the people." Smith visited his latest project in Key Largo when it was just a big yellow building. "I get excited about blank walls," Wyland said. "Isn't that weird? I would really love to tell you exactly what I'm gonna paint but I really don't know. I paint everything from my mind's eye. The way that I work is like a giant Polaroid photograph. You'll see this big blur of color, but eventually like a Polaroid it comes into sharp focus." 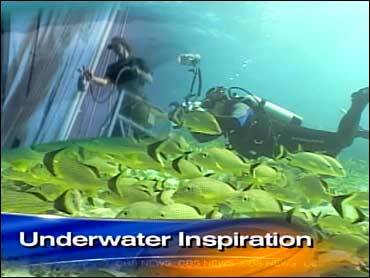 He painted all four walls with marine life he's seen on dives, including the dive he took with Smith. There are sharks like the one he and Smith saw along with lots of coral and fish. Wyland even included the Dolphins that swam beside their boat on the way home. But it's not always perfect. "If I make a mistake, I put a rock there or a piece of coral or a shell," he said. "The whole thing's a mistake the way I work. But in the end it all comes together." And now there are 95 unavoidable reminders of Wyland's undersea world and his message. "If people see the beauty of nature, they'll work to preserve it," he said, "and public art is a powerful medium to get that message out there." Learn how you can help protect marine life at the Wyland Foundation's Web site and learn how you can participate in the Wyland Ocean Challenge.